Saturday in SLO dawned clear and warm so off to the beach at Avila! Lots of people here on holidays so the people watching was fantastic but came nowhere near to the antics of the animal residents of the bay. As the fishing boats came in for the day the pelicans would hang around the fish cleaning station hoping to get some of the offal for dinner. Several tried to swallow pieces so big it took twenty minutes to get them down. While under the pier on the lower level the sea lions have taken over the wharf as their sleeping quarters. They are out of control here and have taken the lower pier for their own! Well, down here in SLO working and unable to get to Anchorage so celebrated the holidays here. Purchased a nice 1/2 bottle of champers and called it a day! Living in SLO I am about 10 miles from the ocean. Yesterday was a glorious California day. 75 degrees and sunny! Off to the beach to check out the boardwalk and the ocean. There are 5 cities in this area.....so this place is 5 Cities. Imagine that. They are Pismo Beach, Grover Beach, Oceano, Shell Beach and SLO. I went to the pier at Pismo. I drove out to Lake Lopez this morning to run in the 5K road race being held in conjunction with the Thanksgiving Craft Fair held in the park. It was the most gruelling road/trail race I have ever been involved. Up and down very steep canyon walls. Seemed like the whole 3.2 miles was uphill. Afterwards there was live entertainment and of course the crafts and performers/bad actors. 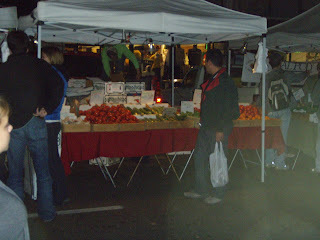 SLO has a farmers market every Thursday night starting at 1800. They close the main street down for six blocks until 2130. There are vegetables and fruit and local restaurants have booths and some street musicians. The turn out every week is really impressive and no signs of trouble at all considering the bars of which there are many and packed to capacity. 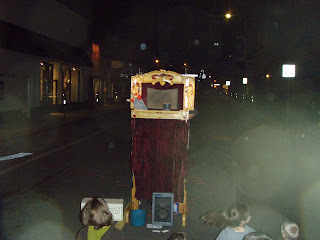 It is a real family affair as there are always lots on littlins hence the Punch and Judy Show. I have been in SLO Town for a week now. Been at the plant doing my CBT(computer based training) and my other required classes. Finally got my Nuclear Clearance so am good to go! As my little house is only three blocks from downtown I tend to walk everywhere. Slo is a beautiful town with 44,000 residents, according to the sign as you drive in. These are pictures of the trees that line a lot of the streets here in town. I have asked several residents what kind of trees but to date no answer. Will get back to you on that. Well made it back to the States last week and spent almost the entire week attached to the head. Picked up a nasty bug!!! Now I am in San Luis Obispo(SLO Town) waiting for the first day of work to start tomorrow at the Diablo Nuclear Power Station. Will be here for five months if all goes according to plan. A great opportunity to fill the cruising kitty. I am staying at a motel that appears to have been built in the 1950s. Detached from other units so I have my own little house. A little more square footage than the cat!